It is a hard balance for Lloyd Sealy Library to keep the collections growing, on the one hand, and to provide more quiet study space for a steadily growing student population, on the other hand. We use our creativity to make rearrangements and carve out new space in the existing library physical plant. This semester, the students are now able to enjoy two new study space additions that are the results of the librarians’ hard work. The computer lab on the ground floor was expanded by gaining a room that can accommodate 24 users. The south wing of the library on the upper level was transformed into the Silent Study Area South, which is full of natural light. The computer lab expansion idea was born more than five years ago. The library was ready to give up space allocated for the staff to satisfy students’ requests for additional computer seats. Moving the walls was not an easy undertaking, but now the students have a renovated space with brand new furniture. 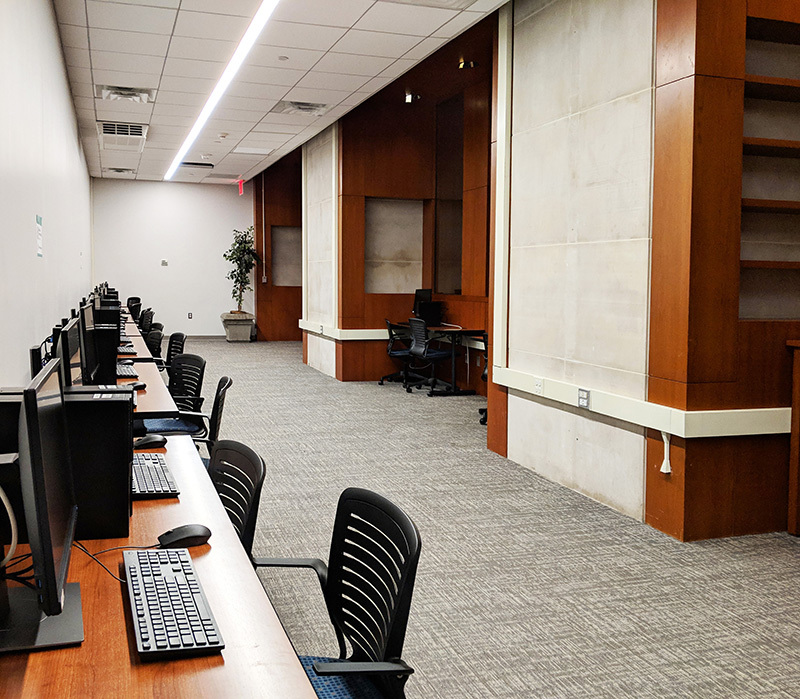 This already popular spot will definitely be appreciated during the 24-hour Library Lounge & Lab operation at the end of each semester during finals period. The creation of the Silent Study Area South was an attempt to make a space without breaking any walls. We decided to compress the bound periodicals collection and create an opening at the end of the south wing on the upper level, mirroring the existing quiet study area in the north wing. Despite the dropped ceiling, the room now looks bright and airy, thanks to the big windows along two walls. It took a month of physical labor this summer by Maria Kiriakova, Matt Murphy, Ellen Belcher, Ellen Sexton, Jeff Kroessler, Mark Zubarev, and Omar Rivera to move 34,200 volumes. We had to make the calculations and measurements first, vacuum the books, rearrange and clean the shelves, and check and fix the records in the catalog. The Office of Space Planning helped with new carpeting and building of two countertops. Geng Lin coordinated the electric and data wiring aspects for both projects. These new study spaces fit well into John Jay College students’ ideal vision of an academic library. The Pop-Up Library’s surveys in March of this year revealed that the young scholars imagined “quiet,” “calming,” and “distraction-free” spaces in their ideal library. These two study spaces fulfill these dreams.